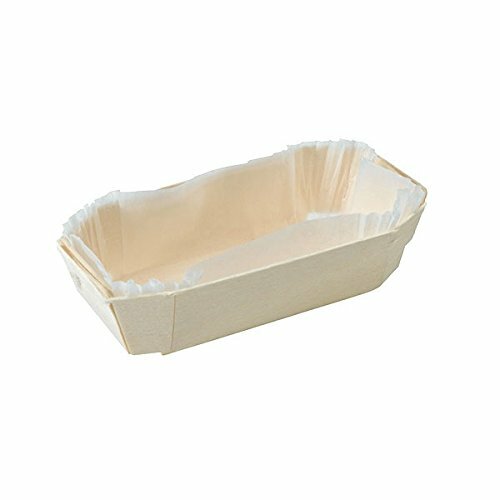 Our Nature Bake wooden baking molds are perfect for baking cake, muffins, brioche, and bread. Made of wood, they offer you the option of baking and serving your culinary creations in one beautiful piece. From the table to the oven, charmingly quaint and rustic, they are perfect for both sweet and savory recipes, a great way to show a homemade touch. Liners are included. Can be baked up to 440 F. Made from FSC certified wood. Dimensions: - 4.5 x 2.6 x .3 inches. PacknWood is the American brand of the family-owned French company First Pack, which has been a leading manufacturer of innovative food service products for over 35 years. From our office in Hoboken, New Jersey we link an international supply network stretching from Asia, Africa, Europe and North America to design fashionable, functional and environmentally sustainable tableware that adds a special touch to your culinary presentation – something we believe your customers will notice and appreciate. All PacknWood products follow the innovative First Pack theme of the ecolomique, a blend of the French words for ecology and economy that First Pack coined in 1990. The idea is simple: we create value using natural, organic and recyclable materials. Our smooth and elegant finished products make the food you serve more enticing, all while preserving the environment. PacknWood offers the largest selection of plates, skewers, mini dishes, bake ware, serving-ware which are made from the most unique and natural materials: Bamboo, Wood, Palm Leaf, Sugar Cane and Cornstarch all with a French touch to the design and presentation.